Are you ready for round two of our Country of the Month tour? We sure are! Next up is the glorious country that gifted the world with delicious meatballs, IKEA and ABBA – Sweden! Here are a few fascinating facts to get us ready to explore all that Sweden has to offer. If there are any lovely Swedes out there reading this please feel free to comment below and add any fun facts that we may have missed. The Swedish Vikings were fearless conquerors. In the 9th and 10th centuries they invaded and settled in parts of Eastern Europe – as far as Constantinople and the Caspian Sea! As of 2012, the population of Sweden is 9.5 million. Sweden’s geographical location makes it prone to cold, dark winters. During this time, some northern parts of the country get as little as three hours of sunlight! 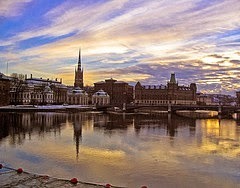 The capital (and largest) city in Sweden is Stockholm; it’s home to 22% of the country’s population. As of 2009, the main official language of Sweden is Swedish; however, there are five other languages granted official national minority status – Finnish, Yiddish, Sami, Meänkieli and Romani. While being a part of the EU, Sweden has managed to retain their original currency of krona. Sweden’s low unemployment rate, low birth rate, highly developed welfare system, and one of the world’s longest life expectancies combine to create one of the highest standards of living in the world. 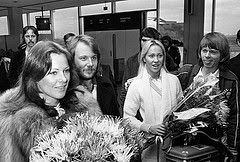 Sweden is widely known for producing great pop bands and singers such as The Cardigans, Ace of Base, The Hives, Robyn and ABBA! It is also known for Ericsson, Volvo, IKEA and H&M – all are prominent manufacturing and technology companies worldwide. Citizens of Sweden have the Right to Public Access (Allemansrätten); this gives everyone the right to enjoy and roam freely through Sweden’s beautiful outdoors. Swedes value punctuality – trains leave on time and meetings start on time. Don’t be late. In addition to celebrating Christmas, Easter, Midsummer and Walpurgis Eve, the Swedes also have a number of food celebrations, such as Shrove Tuesday, Waffle Day and Cinnamon Bun Day to indulge guilt-free in some tasty treats. Swedish meatballs are perhaps the most famous dish of Sweden. 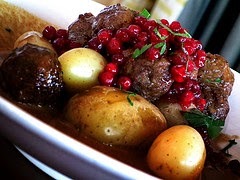 They are usually served with gravy, boiled potatoes and lingonberry jam. Yum! The Swedes love their coffee. According to the International Coffee Organization, in 2011 the average Swede consumed a whopping total of 7.14 kilos of coffee! 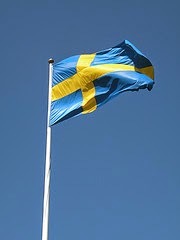 Visit us again soon for more interesting information about the wonderful country and culture of Sweden!